This system cost about 15 bucks at lowes for the pvc and it was super easy to make. That is a 4x2x2 cage but you could have them cut the pvc to any size. Just drill some holes in the bottom and put a tote under for the drainage. Hope this helped! I like your idea very simple and effective. Thanks! I actually got the idea from a forum member, I think it was veiledcham. I drilled 4 little holes in my cage (I've an 18x18x36). 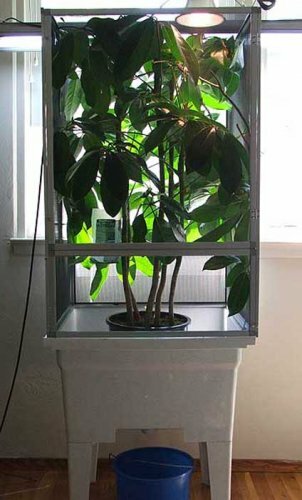 It really depends how your plants are placed but basically I drilled two holes under my plants (my plants sit in those plastic cups fit to them) and two holes in the middle of the cage where most of my water accumulated. 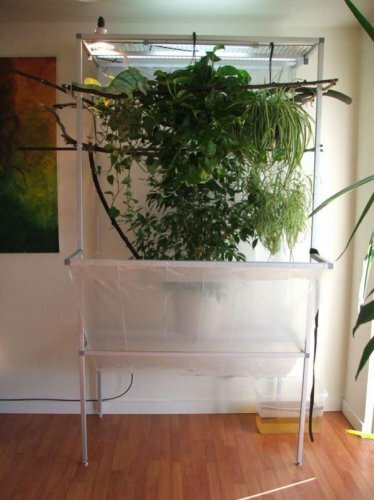 Lift the cage up a few inches (you can put some wood blocks underneath your cage at each corner) and just put a pan underneath your cages to catch the water. It's really simple just doesn't sound like it! Here's my drainage... drilled small holes on the floor and placed on top of shelving unit with rubbermaid container underneath. The shelving unit was $30 at Kmart. Both of these designs work very well, especially for cleaning. The screen cage fits on the sink without the cage bottom, can easily be scrubbed and cleaned without making a mess. i dont have a cage yet, but i will be building one. my idea is to have a screen bottom topped with turf carpet and have a catch pan underneath, tada! for a potted plant, just set on the turf without a saucer, the water will drain right into the catch pan.. I have never heard of a drainage system before. And I have done a lot odd research, obviously not enough. Is this something u have to have? I can't imagine putting a hole on the bottom of the cage and lifting it omitted its side every day and tipping it out, or putting the cage on the side. I assume the newspaper paper will get soaked every day and get soaked and cleaned out everyday? I just have heard if such a thing. I have a totally screen cage. I made essentially a stand with no top slightly bigger than my cage all the way around. Took some plastic from lowes or Home Depot .6 mil I think. Stapled the plastic on the top of the stand with excess hanging in the middle. Then cut a hole in the plastic mounted a shower drain with 2 inch outlet in hole which will pull all the water to the center to drain into a 5 gallon bucket underneath. Across the top of that I ran 5-6 PVC pieces across. So now I can sit my cage onto that. I have support for my plants and great drainage. Also room for my 5 gal. bucket for my mist king. I used the plastic window treatment stuff you can get a any home goods store ( Home Depot lowes wal-mart) double sided tape around three side of each side of the cage put plastic over that and tighten like shrink wrap with a hair dryer. Leave the bottom untaped for ventilation. So wish I could post pics from my iPhone. Thanks for both Supergirl and Garrett. I found all of your solutions aesthetically pleasing, functional and minimal mess. I just bought me a shelving unit just like Supergirls and my outdoor set up is now complete. For my indoor set up, I am going to implement Garrett's idea with the sink. Perfect for smaller space. Just brilliant! Thanks guys. What size are the holes that you drilled? How did you get the water to drain into the sink drain underneath the enclosure. It seems like the water would fall onto the PVC and then drip off the sides of the table. I want to do this for my enclosures soon but I want to make sure I do it right. Dragon Strand offers some awesome drainage trays that fit several other manufacturers cages, he also has a great way to drain they drainage trays into a bucket or whatever. Thank you Clayton i have looked into these and like them very much but I would much rather do what reptoman did and make a drainage table for multiple enclosures. If I buy the dragon pans that is over 120 for two pans so I think id rather make a big drain table that drains both for a lot cheaper. I do very much appreciate the advise though. Can you give me a quick update if you can on this drain table please?. I want to buy the materials this weekend and want to buy the right things. The PVC liner, is that a solid piece or does it come in a role and you just stapled it on top of the table and put he drain in the center? Or can anyone else elaborate on this please I would much appreciate it. I see how he did it. There is no table top, except for the 1" pvc pipe. Under the pipe he has a waterproof membrane, like what pond liners are made of. Pic #2 shows how he mounted the drain. The drain is a few inches below the top edge, as depicted. The drain being centered and below the top edge forms a funnel. Hope that helps.